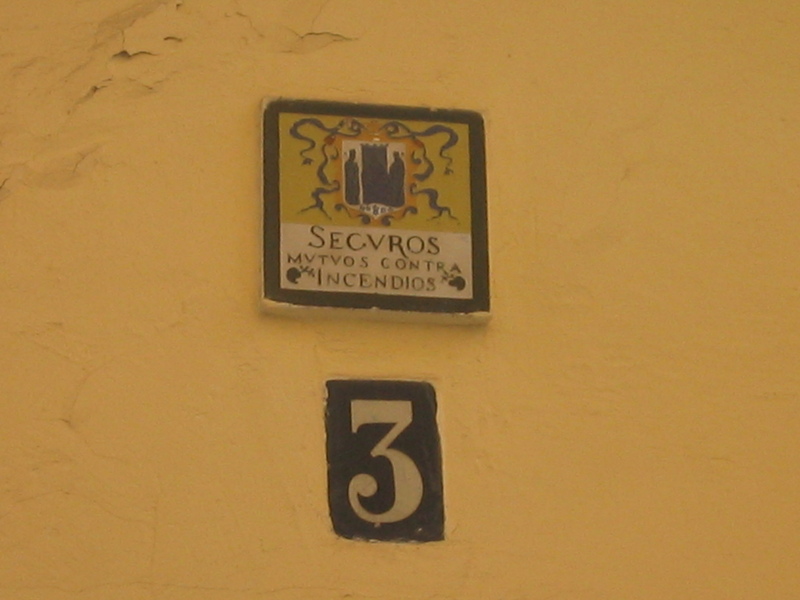 I snapped this photo of plaque over the front door of a house in Seville, Spain, because it records a Hobbesian state of socio-economic affairs: a world without public goods. Used to be that there was no such thing as a public fire department. If your house was ablaze and you wanted help, you’d better have one of these plaques over your door, or you were SOL. If you wanted a fire brigade to come to your aid in such emergencies, you had to join a kind of club with private membership fees. It worked like this: you ponied up the fees, the club gave you a plaque to put over your front door, and then if fire swept through the neighborhood, the club dispatched help, but they *only* assisted paying members. So if you didn’t have that plaque over your door, the fire rescue teams would pass you right on by. It would not be uncommon to find that your house burned down while the one next door would be saved. In many western countries, fire brigades were originally created by insurance companies to safeguard the property of their policyholders. Those who bought policies were given a plaque that would be mounted in a prominent position on the structure to denote its protected status. These plaques can still be seen on some historic buildings, particularly in the United Kingdom. Firemen summoned to burning buildings were expected to look for these plaques before fighting the fire. If the fire was in a building covered by a rival insurer, some brigades would deliberately obstruct that company’s fire brigade in an attempt to give rise to greater property damage (and subsequent expense to the insurer). Etcetera, etcetera, ad nauseum. Actually, privatization of public goods has repeatedly resulted in economic, social and ethical disaster (example: England’s 18th century Acts of Enclosure, or the privatization of France’s war debt by John Law), so why are we still talking about this? That was a a rhetorical question. The answer is: because privatization makes some people incredibly rich.